Las Vegas is known as much for its excess as for its culinary prowess, so it's a super-tempting place to stuff your face with as much excellent food as possible... whether it's a 16-course meal at a French restaurant, or at an iconic Sin City buffet. And if you especially love food from under the sea, you should definitely check out the following options... just think twice before you grab the sushi at some spots. 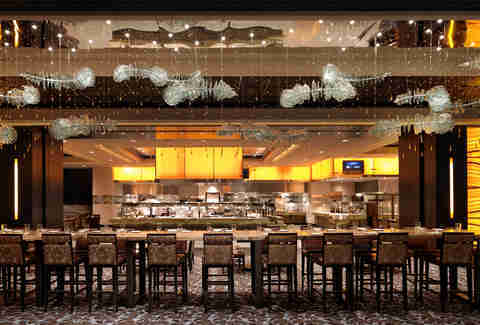 Known for a globally inspired selection, The Buffet at Aria has no shortage of choices for seafood lovers. You can scoop up crab legs and peel-and-eat shrimp, as well as hearty bowls of New England Clam Chowder, or head over to the Asian section for sushi, while scanning the Latin area for some zesty fish tacos. Fresh grilled scallops and salmon are ideal healthy options... but the fish 'n' chips is among the best you'll find anywhere on the Strip. You know a place that goes through 492lbs of shrimp in a single day is going to have plenty of good seafood options. The busy seafood station is your destination for fresh-shucked Blue Point oysters or King crab legs, but you can also order whole, market-fresh fish on the spot. We recommend it grilled and stuffed with lemons and herbs, then seasoned with fleur de sel and fresh cracked peppercorn. If you prefer your fish fried, add tamari, soy, and yuzu sauce with ginger and onions for a nice Asian touch. Bacchanal lives up to its indulgent reputation with a couple of $150 add-on options: whole poached lobster or Sasanian Imperial Caviar. They both come with extra perks... like immediate seating. That alone is almost worth the upgrade. 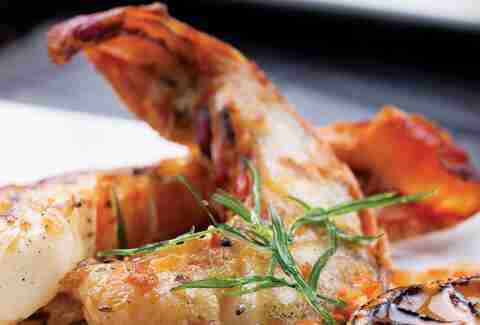 Stop by on Friday nights where a seafood extravaganza runs 4-9pm for $28. Mama Sarah's Cajun crab legs have a loyal following and draw long lines, but there are plenty of other dishes to try as well, including salmon, mussels, and clams. You can also choose from more than forty items to mix into a customized dish at the Mongolian barbecue station. 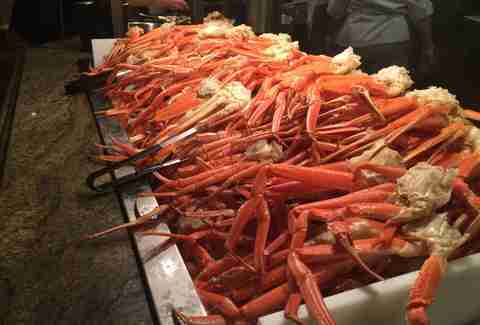 This awe-inspiring buffet just keeps getting better -- especially for seafood lovers. 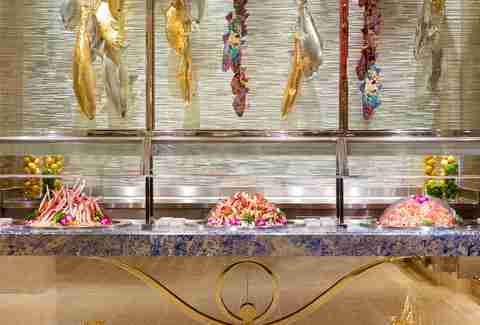 The Wynn upgraded its longtime buffet late last year with 120 new dishes. The oysters Rockefeller, buried in delicious spinach and bacon, can compete with the best on the Strip, and other top choices in the seafood section include Jonah crab claws and Alaskan King crab legs. The sushi is made to order... so don't skip it this time. 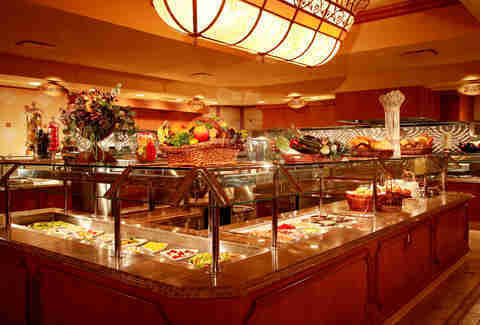 One of more elegant buffets in Las Vegas has a "gourmet dinner service" on Fridays and Saturdays. 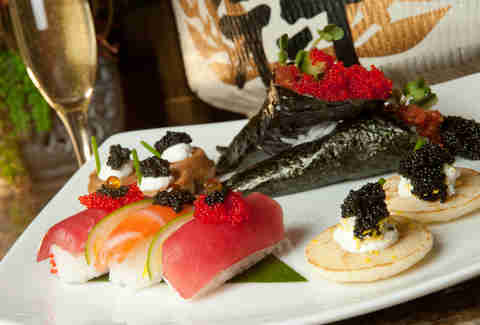 This includes a caviar station, where both ikura and tobiko roe varieties top house-made blinis, small buckwheat waffles, and sushi. 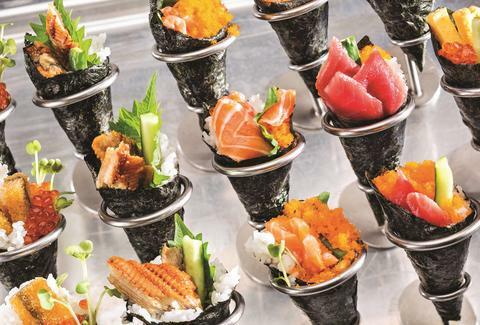 In fact, the sushi and sashimi is among the best you'll find at any buffet on the Strip. Alaskan king crab legs come steamed to order, and the shrimp spring rolls in the Asian area are surprisingly addictive. 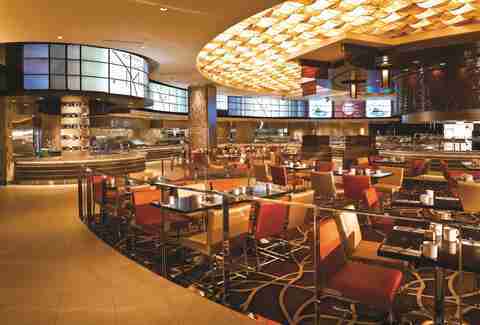 The Rio revamped its buffet in late 2015, effectively combining two into one, and it's turned into one of the best deals just off the Strip. More than 300 dishes are made fresh each day, including more than 70 choices of seafood that come with an additional upgrade charge... which is definitely worth it. Food from under the sea includes Jonah crab claws, grilled ono, fried or chilled oysters, and scallops. The lobster mac & cheese and shrimp & grits are especially popular. You may even find some octopus at the salad station. Keep in mind... the premium seafood section is only open for dinner (3-10pm). 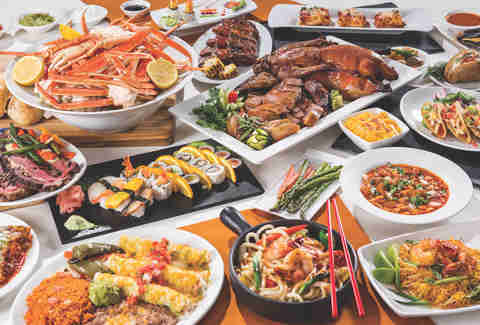 Possibly your best bet for old-school Vegas kitsch, Paradise Buffet is designed to look like a tropical oasis with phony palm trees and a heavy seafood selection on Tuesday (4-10pm) and Friday (4-11pm). For $23, you get access to a "seafood fantasy," that includes the usual favorites like crab legs, oysters, and fried fish. It doesn't break any new ground, but it's a big hit with the tourists that flock to the Fremont casino looking for a good deal. You get a dollar off the price with a B Connected membership, too -- and there's no shame in saving those pennies. They'll come in handy for the slot machines. The Garden Buffet stands out from the crowd by having a seafood experience twice a week -- every Friday and Saturday 4-10pm. The salads, chowders, and fresh vegetables are based on ingredients that change with the season. Standby favorites include Snapper Vera Cruz, seafood enchiladas, baked clams, and carving stations that offer Chinese-style orange roughy and maple-glazed roast salmon. 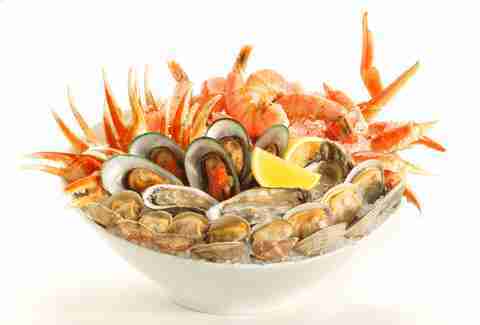 The seafood buffet is $25, with a Casino Club Card (or $29 without one) and includes a glass of wine. Whether red or white is most ideal for seafood... that's up to you. Easily one of the most in-demand buffets on the Strip, Wicked Spoon built its reputation on small samples, with high-quality attention and precision. You'll get plenty of seafood as you roam from corner to corner of the dining room: highlights include ahi tuna poke, smoked salmon, and shrimp ceviche at the salad station; seafood bouillabaisse and cajun shrimp with white cheddar grits, bacon and corn at the "comfort" station; chorizo mussels and seared scallops with polenta at the Italian station; and full-size Kauai shrimp and crab fried rice at the Asian station. Warning: full-size means the heads are still attached. Known for the free booze that's included in the price of admission, the Studio B buffet is never short on seafood dishes, including peri peri shrimp, steamed clams, a crawfish boil, miso-glazed salmon, and baked lemon dory served nicoise style. 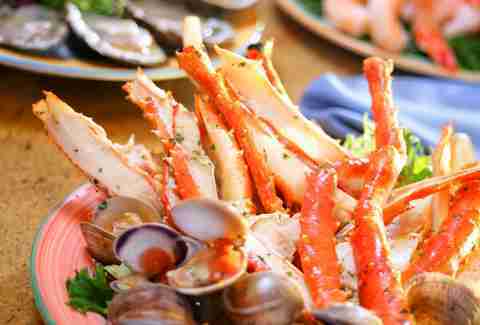 A special seafood buffet runs on Fridays from 2:30-8:30pm for $40, and throws in a few extras, including tempura shrimp, lobster mac & cheese, ceviche shooters, ginger crab at the Asian food station, an oyster bar, and Alaskan snow crab legs that come both chilled and steamed. No matter what you choose, don't skip the lobster bisque. A seafood special at the Medley Buffet runs 4-9pm on Friday and is $25, although the price drops to $20 if you have a Aliante Players Club card. Among the favorites here are jumbo crab legs and plenty of small bites packed with big flavor, including a shrimp ceviche cocktail with cucumber and avocado, and hiva crab salad with a tasty hint of horseradish. 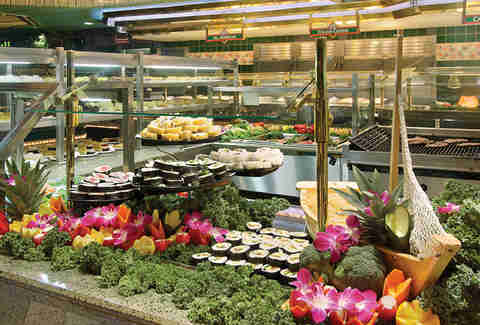 The Golden Nugget buffet gives you a different reason to return over and over on multiple days. While Tuesday is Italian Night and Saturday is Barbecue Night, Friday is possibly the busiest time of the week: Seafood Night. For $27, you can chow down on as many crab legs, mussels, oysters, and bites of shrimp as you want. Not as large or pricey as some of the more well-known buffets on the Strip, but definitely the biggest and most modern of the choices in the Downtown area. 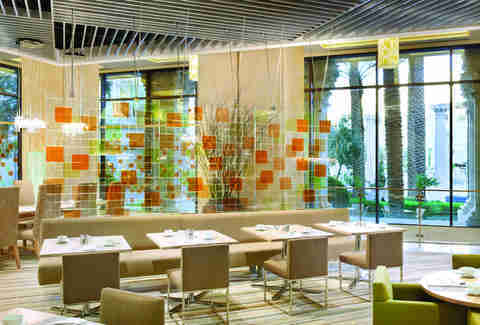 It's only available on Sunday mornings, but the Sterling Brunch is one of the top reasons to visit BLT Steak. There are unlimited pours of Perrier-Jouët Champagne, unlimited servings of American Sturgeon caviar, and yes, unlimited lobster tails. 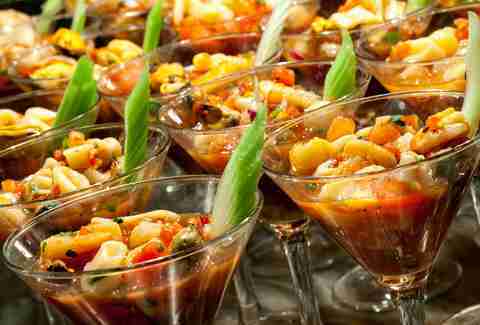 If that wasn't enough, there's also lobster ravioli and -- as a side order -- lobster bisque and lobster eggs Benedict. Rob Kachelriess has been writing for Thrillist for nearly three years. He believes "seafood night" doesn't always have to be on a Friday. Follow him on Twitter @rkachelriess.